Through my storytelling, speaking, writing, art, and Peace Ministry, I seek to build bridges of harmony and kinship from human to human and from humans to the natural world. Here among the flora and fauna in rural Eastern PA, the perfect setting for quiet, personal reflection, I practice "deep listening" to capture the wisdom that is always present in nature. At an early age, writing became a favored pastime and means of expression. when I was eight I wrote, illustrated, and constructed my first book, Sammy the Seal, a story that depicts how cooperation is a critical path to peace. My passion was re-ignited at age 40 when I began writing and telling my own stories to children and published a quarterly newsletter covering Native American wisdom and issues. Out of these endeavors grew a greater fervor for writing and sharing personal stories and workshops with adults in hopes that the passion and child-like wonder of listeners and participants is sparked; that they are inspired to find their own unique, expressive gifts. 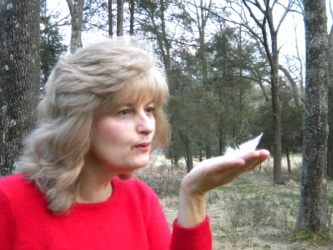 The idea for my book, Feather Gifts for all Ages, grew from a simple sentence that was shared with me by a Native American friend who said, "A feather is a messenger." From that point on I was on a quest to uncover the meaning of her statement and feathers were strewn on my path in numbers so great that I had to pay attention. Meditating on many of those feathers led to a profound personal awakening and understanding that I wanted to share with the world. I believe there is an encyclopedia of wisdom available to us all when we become silent and still, whether it be in a grassy, flower-filled meadow, walking deep into a forest, or sitting at the base of a tree in our own backyard with sunbeams caressing our being. What is shared in Feather Gifts is only the beginning of what is available to us. EVERYTHING we need to know is outside, away from technology and daily stress, placed there at the beginning of time. Earth Divine - Adventures of an Everyday Mystic, my second book, contains individual stories from my personal growth journey that depict what is possible when we reconnect with nature and heal the accumulated wounds that life hands us. It is my hope that by reading about my journey new worlds of possibility may open to you. My latest creation and first CD, "Mystic - Stories of Magic and Wonder," contains a few of my favorite stories from Earth Divine as well as some new pieces. As a field representative for Earthwatch Institute I keep my eyes peeled for opportunities to share the wonderful experience of my expedition studying gray whales in the Baja of Mexico. earthwatch.org/ I recently joined Tree Sisters as an advocate for saving, planting, and protecting our trees. www.treesisters.org/ From the depths of my heart, may you discover Wisdom and Wonder, true Peace, and the greater meaning of Love through stories, old and new, and connection to the natural world that is our home.